Really finishes off the matching Laura Ashley Lidia quilt set. The shams are a nice dusty rose. Though they are 26 x 26 inches, I put a 28 x 28 inch pillow in each of them, as it helps fill out the sham. 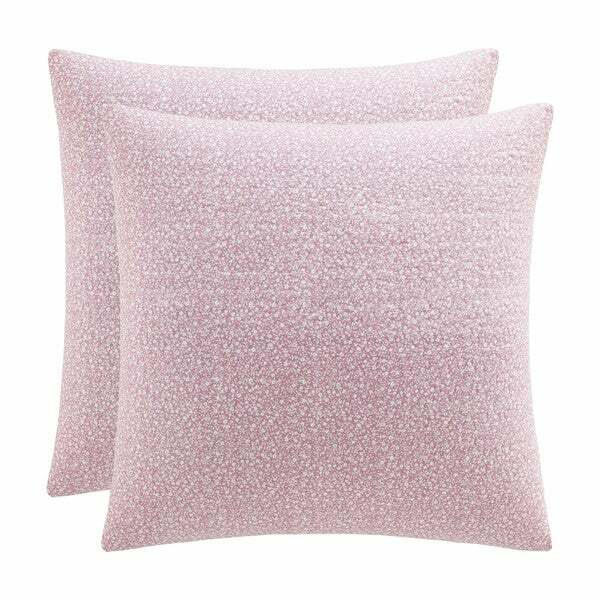 This set of two Euro sham covers from Laura Ashley is beautifully constructed from a pink floral cotton fabric with hidden zipper closures. 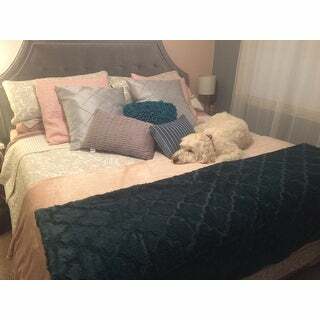 The pillows are quilted on the front to add a classic texture to your bedding. The Euro sham covers are removable and machine washable. These shams are a great accent piece when coordinated with the Laura Ashley Lidia quilt set. The quilt set comes with a standard sham so having the European sham pillow on the bed adds a nice "pop" and completes the look well. These shams are perfect and look great with the Laura Ashley Lidia Quilt set! Glad I added them to the set. This set of sham covers is beautiful. They are true to color and enhance the beauty of my beadspread. These pillow shams are just lovely and match my Laura Ashley bedspread perfectly. I ordered these shams to match a kid's quilt set that needed more frill. The pink on these shams were a perfect match and the material fills really nice. It is prewashed. Only polyester fill. Not poly/cotton mix of entire line. As one woman said it shrinks, another color was off. All untrue. Looks just like photo, bought 26?inch eco pillows on site. Fit perfectly inside. Shipping takes about 7 working days. Worth the wait, I missed sale prices by a couple day on whole set. Hope they will adjust price. Very Hasppy. Goes perfectly with the Laura Ashley quilt. I'm very pleased with these pillows. I purchased them to go with a gray and white *** quilt. They are very soft and the pink is a very soft, pretty color. I ended up needing a little more color so I added some teal and silver and am very happy with the end result. They are fine. Color shifted in first wash, so may have to replace soon, they do not look as vibrant even after careful wash. Zipper is intact, so if you like the washed out country look - these are for you. Went great with rose bedspread! Love it!! All good. No complaints. Material was soft and good match with quilt. Great color and quality. Are beautiful with my bedset! I was dressing a luxurious bed all at once and apparently didn't look close enough to notice these are covered in tiny white flowers. That's very much typically NOT my thing but I'm glad I didn't look closer because they're really quite lovely. These are prettier than I hoped they would be in person! I am extremely happy with my purchase! "do these include the pillow insert?" No, this is just the shams. These will compliment my Lidia quilt and will add the pop of color with my white furniture. Beautiful print. Quality fabric. Washable. Perfect look for my bedroom décor.